Austrian painter. He came from a family of artists in Vienna, his father was a sculptor. After his studies at the Vienna Academy in 1738-49, he worked in Brnn in the 1750s and in Prague in 1760. 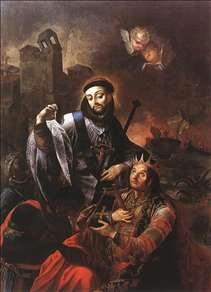 Kracker, a significant Austrian artist of baroque, spent most of his life in Hungary. 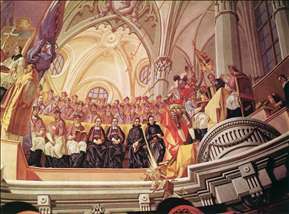 He first visited Hungary in 1757 to paint three side-altars for the church in Sasvr and several frescoes for the cathedral and monastery in Jsz in 1762-65. 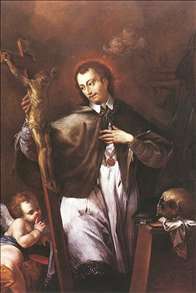 He worked most of the time in Eger from 1765 until his death. 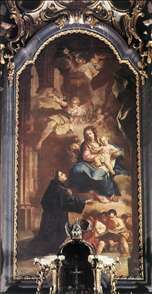 He painted the high altar with St. Anthony and the side-altar with St. Anne for the Minorite church, Eger, in 1769-70. 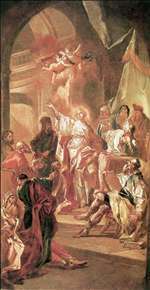 His major work is a fresco in the Library of the College in Eger (1778) which shows the council in Trident, and a fresco in the Podmaniczky Castle, Aszd. His late works prepared the way for classicism. See more details about "Saint John of Nepomuk"
See more details about "Appearance of the Virgin to St Anthony"
See more details about "The Council in Trident "
See more details about "The Dispute between St Catherine of Alexandria and the Philosophers"
See more details about "St. Francis of Solano Baptizing Indians"